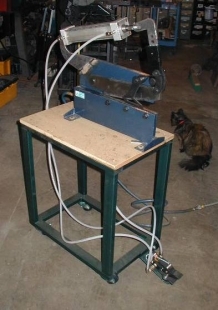 Homemade conversion of a 12" hand shear to pneumatic. Features a 2.5" air cylinder and operates at 100 psi. Cuts 1/8" aluminum, 3/8" round, and 18 ga steel.